Year-round permits for Angus residents will be made available this week as the meter ticks down to the introduction of charging in the area’s car parks. The installation of solar-powered pay stations and signage across more than 30 car parks is continuing and council officials say they are on schedule for the November 1 re-introduction of fees after a gap of more than two decades. An online system for buying six-month or yearly permits is due to become operational on Thursday but residents say they are unhappy to have been left so little time to make sure they have a ticket. An Angus Council spokesman said: “Online payment systems are currently being finalised with the intention of permits being available to buy via the Angus Council website from Thursday October 18. 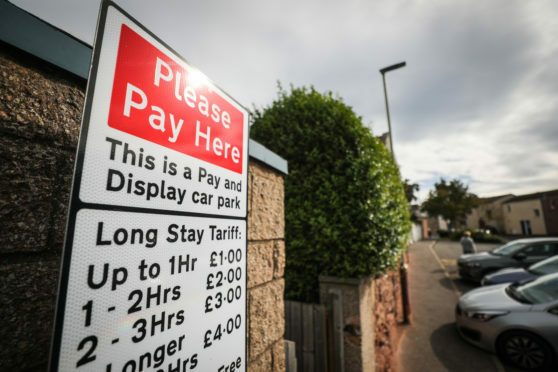 “A 12-month permit will cost £260 and a six-month permit will be £130 – offering choice at an equivalent fee of £1 per day (based on parking five days a week/per year) and applying to any and all off-street car parks where there are charges. “Each permit will be able to be transferable between a maximum of three vehicles, but must not be used by more than one vehicle at a time,” the spokesman added. Jean Clark, of Brechin said: “As a car owner who has no garage and has to park in a local car park, I phoned the Access Line for help as there was nothing re parking permits on the Angus Council website. “The website certainly gave charges but nothing about applying for a permit which I feel I need. It will cost £1 an hour to park in off-street car parks, up to a maximum of £4 for four to nine hours. Short stay car parks will remain limited to two hours and a maximum of £2. In total, 33 off-street car parks will be subject to charges, but the council has decided not to apply them at Fowlis, Glamis or St Vigeans, Rosemount Road and Elliot in Arbroath, as well as William Street, Ferryden and the north and south seafront facilities in Montrose. The authority forecasts the move will generate £700,000 a year, a figure previously described as “optimistic” by one councillor.